So, what exactly are Super-Tuscan wines? The Super-Tuscan movement came into being in the late 1960’s - early 1970’s when some visionary Tuscan producers, frustrated by the rigidity of DOC and DOCG regulatory requirements regarding permissible wine varieties and ageing regimens, decided to start crafting and marketing new types of wine that defied regional traditions and regulatory requirements. In the process they crafted some remarkable wines that quickly caught the attention of the wine world and became recognized as some of Italy's best. As market demand soared, prices rose and Super-Tuscans also became some of Italy’s most expensive wines. Broadly speaking, a Super-Tuscan can be made with just about any varietal. Some Super-Tuscans use Sangiovese exclusively or Merlot or Cabernet Sauvignon exclusively. Still others exclude Sangiovese and other Italian varieties altogether and use varying combinations of Merlot, Cabernet Sauvignon, Cabernet Franc and other international varieties in crafting Bordeaux-style blends. The variety and/or blend can be practically anything and producers frequently fine-tune the wines by varying the composition of the blends from year to year. In addition to use of non-traditional “international” varieties the Super-Tuscan producers also experimented with innovative vinification protocols and ageing regimens such as the length of the ageing period and use of small oak barriques or cement vats for ageing. But there was a price to be paid. Since they didn’t play by the existing rules the producers couldn’t use the prestigious DOC or DOCG designations and had to label their wines with the less prestigious Vino da Tavola or “ordinary table wine” designation or the formal term used today which is "generic wine". When the Italian wine authorities created the Indicazione Geografica Tipica (IGT) category in 1992, it quickly became the preferred denomination for Super-Tuscan wines. The IGT designation permitted greater flexibility in crafting wines than did the more rigid, traditional DOC or DOCG designations and it also carried greater prestige than the bottom-shelf Vino da Tavola designation. The term “Super-Tuscan” is not an official designation so that term doesn’t appear on wine bottle labels. Rather, it is an informal designation and there are no hard and fast rules governing how Super-Tuscan wines are produced. These wines are in effect proprietary wines created to reflect individual producer’s styles and predilections. Today, almost every Tuscan estate produces at least one Super-Tuscan wine and there is a formidable parade of Super-Tuscans with enigmatic names on wine shop shelves. Producers have great flexibility in the names they give to their Super-Tuscan wines and most bear the name of some ancestor or family member, some geographic feature of the estate or vineyard or simply on some personal whimsy. I recently had the pleasure of hosting an informal tasting of seven select Super-Tuscan wines. The majority of wines ranged in price from the high $50’s to a high of $70 with one outlier priced at a remarkably low $26. So, while they’re not exactly inexpensive neither are they top-of-the-wine-list expensive. Regardless of price all of the wines ranked high on a quality-to-price basis and all are available in major U.S. markets. The wines were tasted “blind”, that is the identity of the wines wasn’t revealed until after all the wines had been tasted and evaluated. Most wines were from the 2009, 2010 and 2011 vintages so all had some age behind them and generally displayed the poise and confidence that comes with maturity. My personal favorite wine of the evening was the 2010 “Sammarco” from the Castello dei Rampolla. Although full-bodied and rich with dark fruit aromas and flavors it is nicely balanced and manages to maintain an aura of subtlety and elegance. The group as a whole, however, favored Tenuta del Cabreo’s 2010 “Il Borgo” with its opulent, caressing style. It is worth noting that only a few points separated all the wines tasted so it’s fair to say there were no losers in any qualitative sense. The wines are listed below alphabetically by producer. Sammarco was one of the earliest Super-Tuscan wines to come to market although nobody called it that at the time. Its initial release garnered wide critical acclaim and today it is generally recognized as one of Tuscany’s signature collectible wines. The Castello dei Rampolla was also one of the first Tuscan wineries to implement an organic and biodynamic approach to winemaking. Chemical treatments in the vineyards are prohibited and every operation in the vineyard and cellar follows the lunar biodynamic calendar. It’s complicated, time consuming and tough but is indicative of their dedicated and patient approach to winemaking. The 2011 Sammarco is primarily Cabernet Sauvignon with the addition of 5 percent each of Merlot and Sangiovese. The wines are vinified separately. After initial and secondary fermentation, the Sangiovese is aged in large oak barrels while the Cabernet and Merlot are aged for 18 months in French oak barriques. The wines are then blended and bottled where it rests for an additional 8 months prior to release for sale. The wine has a deep purple color with elevated plum and ripe black fruit aromas that segue into a swell of dark fruit flavors. While full-bodied, rich and intense, it doesn’t overwhelm and lose its sense of style and subtlety. There is a judicious touch of oak and an ever-so-subtle sweetness to the thick, ripe tannins that lead into a long, lingering finish. As impressive as it is now, this wine will continue to improve with some additional ageing. An impressive offering from one of Tuscany’s most respected producers. The Fonterutoli estate is a historic wine-making estate with deep roots, so to speak, in the Chianti Classico region. Owned by the Mazzei family since 1435, the estate has maintained consistently high standards over the centuries and today is one of Chianti’s – and Italy’s – most acclaimed wineries. Over the years the Mazzei family has also been a tireless promoter of the overall Chianti Classico brand. The “Mix 36” is pure Sangiovese but consists of 36 different Sangiovese biotypes. So, it’s a monovarietal blend. The selected biotypes are the result of an intense, decades-long estate research project designed to identify the Sangiovese biotypes appropriate for producing the highest quality wines for any given vineyard site. The grapes are fermented and then aged for 20 months in 500-liter French oak barrels followed by an additional 9 months in the bottle before release. It is an elegant Sangiovese with a refined and intense aromatic profile, red berry fruit flavors and excellent balance of acidity and fruit. This pure Sangiovese seduces with both its finesse and richness. Fattoria di Felsina is another of Tuscany’s great wine names and has over the years produced some of the most age worthy and complex Super-Tuscans. However, rather than fiddle with international-styled blends that utilize Cabernet Sauvignon or Merlot, for example, the estate focuses almost exclusively on the Sangiovese variety. Fontalloro is composed entirely of Sangiovese sourced from 50-year old vines in three of Felsina’s top vineyards that straddle the border between the Chianti Classico and Chianti Colli Senesi districts. The wine is aged in barriques for 20 months and then spends an additional 10 months in the bottle prior to release for sale. 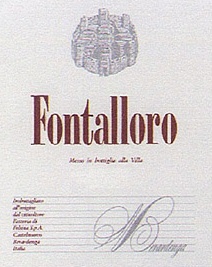 The 2010 Fontalloro is rich and textured with black cherry and spice notes accompanied by smooth tannins. It’s a structured but elegant wine and a great example of a quality Super-Tuscan. Tenute Guicciardini Strozzi is a historic Tuscan wine producer which has evolved over time and today has vineyard estates throughout Tuscany and southwest Sicily. The original estate, Tenuta Villa Cusona, is close to the medieval town of San Gimignano, where they produce both the estate’s flagship white wine, its Vernaccia di San Gimignano, and the notable Sodole which is made entirely of Sangiovese. Sodole is a cru Super-Tuscan produced from hand-selected Sangiovese grapes from a single parcel named Sodole in the heart of the Cusona vineyards. The wine undergoes long maceration on the skins and is aged in French oak barriques for 12 months with an additional year in the bottle prior to release for sale. It is only produced in the best vintage years. As an aside, the person depicted on the label is that of an ancestor, Francesco Guicciardini, who was a prominent historian and political philosopher in early 16th century Florence. This pure Sangiovese is firm, full-bodied and structured with a well-integrated hint of oak spiciness. Careful selection of the best fruit from its low-yield vineyard and modern winemaking techniques has yielded a beautifully textured and sensuous wine that, while ready to drink now, will continue to age well. Although it has been intimately involved in the Tuscan wine scene for centuries, Agricola San Felice has kept up with the times and today is a modern, diversified winery. The estate is located in the small town of Castelnuovo Berardenga in the gently-rolling hills of the southern-most portion of the Chianti Classico zone and is named after an 8th century church on the property. 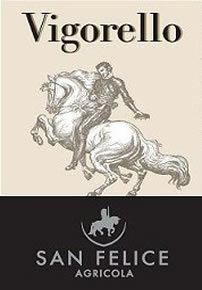 San Felice’s “Vigorello” has a distinguished pedigree. Initially produced in 1968 it was one of the earliest commercially available wines that later became known as Super-Tuscans. San Felice’s 2011 Vigorello is a Bordeaux-style blend of 50 percent Cabernet Sauvignon, 45 percent Merlot and 5 percent Petit Verdot. It is aged in French oak barriques for 2 years and then spends 10 months in the bottle. It has a deep purple color that leads to enticing, complex aromas of blackberries, plums and toasted nuts that follow through in the flavors. It has generous tannins and a long finish with some trailing notes of vanilla. While this wine’s ripe fruit character gives it an international flavor it is also persuasively Italian with its structure, composition and vigor as its name implies. The Cabreo winery is located in the gently-sloping hills around Greve-in-Chianti. It is one of several wine estates owned by the father-son team of Ambrogio and Giovanni Folonari. The Folonari is another family with deep roots in Tuscan wine history. The Folonari family entered the wine trade in the late 1700’s and Giovanni is the 8th generation of the Tuscan wine family. The 2010 Cabreo “Il Borgo” is a 70 – 30 percent blend of Sangiovese and Cabernet Sauvignon, respectively. The two varieties are harvested and vinified separately, but both undergo fermentation in steel tanks at controlled temperatures with protracted maceration on the grape skins so as to enhance the wine’s body, color and texture. The varieties are then combined and aged in a combination of new and used French oak barrels for 18 months with 6 additional months in the bottle prior to release. The wine is “international” or, dare I say, “Californian” in character, i.e., full-bodied, rich and fleshy with spicy black fruit flavors, thick, ripe tannins and a long, juicy finish. The 14.5 percent alcohol provides ample tension and drive throughout. The Sette Ponti estate lies about fifteen miles northwest of Arezzo in the Chianti zone. The name Sette Ponti translates as "seven bridges" and refers to the seven ancient bridges that cross the Arno River between Arezzo and Florence. The Sette Ponti estate is owned by Antonio Moretti Cuseri, the talented and uber-successful textile entrepreneur and veteran wine producer that is generally regarded as one of Tuscany’s most innovative and quality-driven producers of world-class Super-Tuscan wines. In addition to Sette Ponti, Moretti Cuseri also owns the highly-regarded Poggio al Lupo and Orma wine estates in Maremma, Tuscany’s premier coastal wine region, and the Feudo Maccari winery in the Noto area of southeastern Sicily. 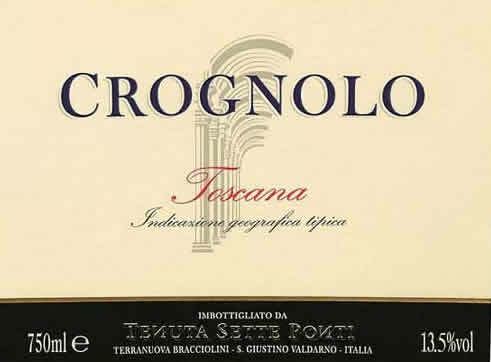 Crognolo is a blend of 90 percent Sangiovese and ten percent Merlot grapes sourced from 30 to 40-year old estate vines. The wine is aged for 14 months in French oak barriques and spends an additional 6 months in the bottle before release. This stylish Super-Tuscan blend merges the austerity and structure of Sangiovese with the suppleness and fruit-forward flavors of Merlot to yield a firmly structured and flavorful yet elegant wine. It is full-bodied and brimming with ripe cherry and blackberry flavors supported by supple tannins and a touch of spice that gives lift to the long, fruity finish. The 2014 Crognolo is an elegant and beautifully-textured Super-Tuscan at an extremely reasonable price and, while drinkable now, will continue to evolve and mature over the next several years. Note – prices indicated are averages of national retail prices but will vary from store to store. However, since availability is not guaranteed it's best to call the wine shop or check their website for availability and price before making the trip. Help keep this website ad-free and independent. Consider making a contribution to support the work of WineWordsWisdom.com. For your safety and security, all transactions are remotely processed using PayPal's secure servers. PayPal account to make a contribution as PayPal will also process regular credit card transations.